The first time I saw Priscilla I knew I wanted to make portraits of her. And now finally that wish came through. We did a great photoshoot together. Priscilla has great tattoo’s. And she keeps them as one coherent piece of art by keeping them all in monochromatic style. I think it that makes it extra special. And sometimes Priscilla wore some lovely feminine and sweet tinted outfits which contrasted greatly with her tattoo’s. So in this shoot we wanted to catch that contrast. 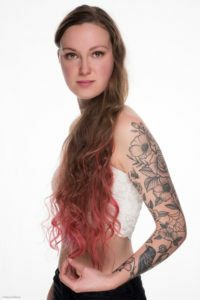 Beside the tattoo’s, did you notice the beautiful long hair Priscilla has? For this shoot we used a beauty setup for lighting. As key light we used a strobe with a beauty dish. As a fill we used a small octabox from below. And behind her is a third strobe with a giant soft box functioning as a white background. 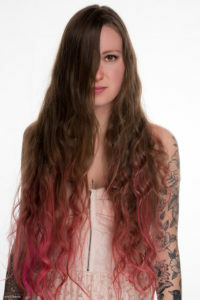 So thank you Priscilla for doing this shoot with me and being such a cool and expressive model. I somehow have a feeling there will be more shoots to come with Priscilla in the near future.